Jonathan’s book contrasts two different paradigms that he argues could define the Net’s future: The “generative” Net versus what he refers to as a world of “tethered, sterile appliances.” By “generative” he means technologies or networks that invite or allow tinkering and all sorts of creative uses. Think general-purpose personal computers and the traditional “best efforts” Internet. “Tethered, sterile appliances” by contrast, are technologies or networks that discourage or disallow tinkering. Basically, “take it or leave it” proprietary devices like Apple’s iPhone or the TiVo, or online walled gardens like the old AOL and current cell phone networks. “Today, the same qualities that led to [the success of the Internet and general-purpose PCs] are causing [them] to falter. As ubiquitous as Internet technologies are today, the pieces are in place for a wholesale shift away from the original chaotic design that has given rise to the modern information revolution. This counterrevolution would push mainstream users away from the generative Internet that fosters innovation and disruption, to an appliancized network that incorporates some of the most powerful features of today’s Internet while greatly limiting its innovative capacity—and, for better or worse, heightening its regulability. A seductive and more powerful generation of proprietary networks and information appliances is waiting for round two. If the problems associated with the Internet and PC are not addressed, a set of blunt solutions will likely be applied to solves problems at the expense of much of what we love about today’s information ecosystem.” [p. 8]. In other words, Jonathan fears that many people will flock to tethered appliances in a search for stability or security. That’s bad, in his opinion, because those tethered appliances are less “open” and more likely to be “regulable,” either by large corporate intermediaries or government officials. 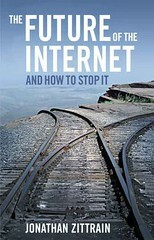 Thus, the “future of the Internet” he is hoping to “stop” is a world dominated by tethered digital appliances because it is too limiting and too easy for others to control. My primary objection to Jonathan’s thesis is that (1) he seems to be over-stating things quite a bit; and in doing so, (2) he creates a false choice of possible futures from which we must choose. What I mean by false choice is that Jonathan doesn’t seem to believe a hybrid future is possible or desirable. I see no reason why we can’t have the best of both worlds–a world full of plenty of tethered appliances, but also plenty of generativity and openness. Importantly–and Jonathan acknowledges this point to some extent–the boundaries between “generative” and “tethered appliances” are growing increasingly murky. Social networking sites, for example, allow a great deal of generative activity, but they also impose some limitations on what can be posted, or limit the porting of profiles / information over to other sites. Similarly, the iPhone—which Jonathan calls a “sterile” technology—was completely closed at first, but is now growing more open to tinkering with the SDK rollout. But it’s unlikely it will ever be perfectly open. Finally, the TiVo, which Jonathan also throws into the “sterile” bucket, is a tightly controlled technology in some ways, but allows consumers to do some truly wonderful things with it within certain confines. And there’s a good reason for all of this: Hybrid solutions often make a great deal of sense. They offer creative opportunities within certain confines in an attempt to balance openness and stability. And this brings us back to how Jonathan is over-stating his thesis, in my opinion; he just doesn’t convince me that the old order—of open networks & general-purpose PCs—is dying. It’s still around and always will be. It’s just that a new crop of characters—let’s call them “mere mortals”—have joined us in cyberspace and are increasingly part of the ongoing digital experience. But those of us who are true-blue tech geeks and tinker-happy gadgeteers still have plenty of generative toys at our disposal even though the mere mortals now walk among us. So, my question to Jonathan is—to quote the great philosopher Rodney King—Why can’t we all just get along? Isn’t it a sign of progress that we now have different models that appeal to different types of users? After all, those supposedly “sterile” applications like the iPhone and Tivo are loved by millions. Even calling them “sterile” seems a bit silly to me. After all, those devices have “fostered innovation and disruption” just like PCs and the Net have, just in a different way. Regardless, does Jonathan think all those people would really be better off if they were forced to fend for themselves with completely open iPhones and TiVos? Should the iPhone be shipped to market with no apps loaded on the main screen, forcing everyone to get them for on their own? Should TiVos have no interactive menus out-of-the-box, forcing you to go online and find some homebrew that someone whipped up to give you an open source guide in all its blocky ugliness? Again, before you answer that question for yourself, put yourself in the shoes of a mere mortal. It’s easy for many us who are tech geeks to look down our noses at those who seem to want to have the hand held through cyberspace or digital experiences. But there’s nothing wrong with those people who seek stability and security in digital devices and their networking experiences—even if they find those solutions in the form of “tethered appliances.” Not everyone wants to have the same cyber-experiences we do. Not everyone wants to reprogram their mobile phones, hack their consoles, write their own code, or even just write a blog or join a social networking site. Millions upon millions of people live perfectly normal lives without ever doing any of these things! (It’s true, I’ve even met a couple of these people… They are called my parents!) Still, many of those mere mortals WILL want to use many of the same toys we tech geeks use, or take cautious steps into the occasional cold pool called cyberspace—one tippy toe at a time. Why shouldn’t those folks be accommodated with “lesser” devices? Moreover, a big part of the gap here is simply generational and will pass with time. Once today’s tech geeks are grandparents, most of our kids and grandkids will largely demand the same sort of systems we do because they will be more accustomed to the occasional downsides that accompany the Wild West that cyberspace can sometimes be. But there will always be a crowd who demands some hand-holding and added security. Jonathan’s short-term concern about how the desire for more stable and secure systems will lead to a more “regulable” world, is understandable. Concerns about privacy, child safety, defamation, identity theft and so on, will continue to lead to calls for more intervention. At the corporate level, however, some of that potential intervention makes a great deal of sense. For example, if ISPs are in a position to help do something to help alleviate some of these problems—especially Spam and viruses—what’s wrong with that? Of course, it gets a lot trickier with things like child safety and copyright issues. That’s where excessive intervention by ISPs could create serious speech and privacy problems—namely in the form of a forced surrender of anonymity. That’s exactly right. We can find happy middle-ground solutions. By contrast, Jonathan’s alternative solutions to these problems are quite amorphous. He speaks of the need for a “latter-day Manhattan project, not to build a bomb but to design the tools and conventions by which to continuously defuse one.” (p. 173). That seems like a strange metaphor or paradigm for him to choose since the Manhattan project was highly secretive and centrally planned, the exact opposite of what he seems to desire. But, again, what he desires remains very murky. It seems he wants to solve the problems brought about by openness with more openness—primarily in the form of collective intelligence and action. If we all just find smart ways to work together, we can improve open systems, he argues. Well, sure we can.. sorta. But it will never work perfectly on its own. Some people are going to want more safety and security. They should get it, even if comes in the form of “sterile appliances and tethered devices.” Because, again, the rest of us always have the option to choose something else. I have many problems with that logic. First, most developers who offer open APIs aren’t likely to close them later precisely because they don’t want to incur the wrath of “those who built on top of their interface.” But, second, for the sake of argument, let’s say they did want to abandoned previously open APIs and move to some sort of walled garden. So what? Isn’t that called marketplace experimentation? Are we really going to make that illegal? Finally, if they were so foolish as to engage in such games, it might be the best thing that ever happened to the market and consumers since it could encourage more entry and innovation as people seek out more open, pro-generative alternatives. Anyway, read Jonathan’s book. I’ve probably gone a bit too hard on him here, but it’s an important and enlightening book about one possible vision of the Net’s future. In the end, I guess my outlook is just a little rosier than his.